The IP tools page is used to check connectivity, both from the Smoothwall to computers on its local networks, and to hosts located externally on the Internet. Ping establishes that basic connectivity to a specified host can be made. Use it to prove that the Smoothwall can communicate with hosts its local networks and external hosts on the Internet. 1. Go to System > Diagnostics > IP tools. 2. Select Ping from the Tool drop-down list. 3. Enter an IP address or hostname that you wish to ping in the IP addresses or hostnames field. 4. 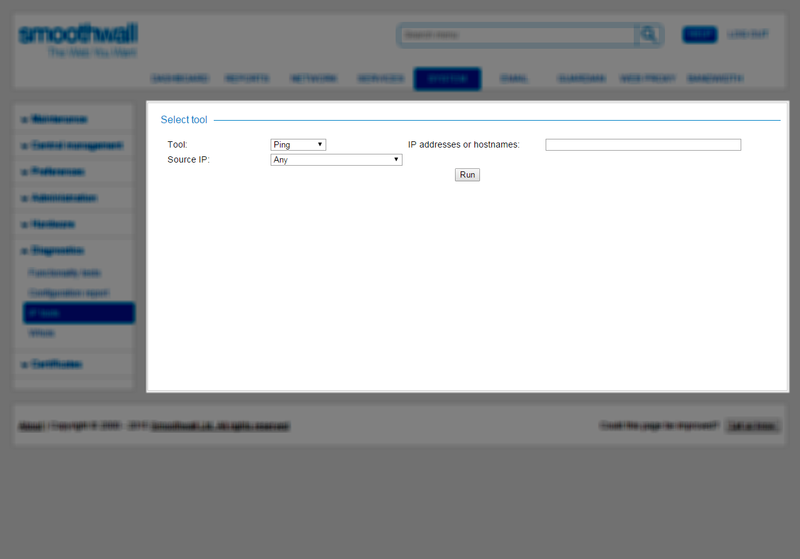 You can choose to ping the entered IP address from any interface or IP address configured on the Smoothwall. To ping from a specific interface or IP address, choose it from the Source IP drop-down list, else leave it as Any. Traceroute is used to reveal the routing path to Internet hosts, shown as a series of hops from one system to another. A greater number of hops indicates a longer (and therefore slower) connection. 2. Select the Traceroute option from the Tool drop-down list. 3. Enter an IP address or hostname that you wish to trace in the IP addresses or hostnames field. 4. You can choose to start the trace from any interface or IP address configured on the Smoothwall. To trace from a specific interface or IP address, choose it from the Source IP drop-down list, else leave it as Any. The output of these commands is as it would be if the commands were run directly by the root user from the Smoothwall console.